Steven Staryk is one of the great violin virtuosi of our time. In addition to serving as concertmaster of three of the great orchestras—Chicago, London, and Amsterdam—he was a prolific soloist and recording artist. His recently-released Staryk Anthology (starykanthology.ca) and Retrospective (Centaur Records) are monumental collections, spanning over 50 years of recordings on 19 violins. Many of the great virtuosi are monogamous when it comes to their fiddles. One associates Menuhin with his 1714 Soil Stradivarius, Stern with his Ysäye Del Gesu, or Hillary Hahn with her Vuillaume. But Staryk is unusual in that he’s owned or played on more great violins than just about anyone, including approximately 40 Strads and 26 Del Gesus, and not just for an hour or two, but for significant periods of time. Each track on the Anthology indicates the violin used. When I studied with Staryk in the late 80s and early 90s, he had the ex-Barrere Strad, which had a beautifully refined quality, neither too bright nor too dark. It was only recently that I discovered that he had owned and performed on such a vast number of great instruments. Few are the dealers or collectors who have been able to judge their instruments in the way that only an elite player can, which makes Staryk an authority of a most unusual kind. Recently, I called Staryk, now retired and living in his hometown of Toronto, and we had a wide-ranging discussion about violins old and new. Q: You’ve played and owned a wide variety of Strads and Del Gesus. What differences in playability have you found between the two? A: Violins that have more ring after the note are easier to play, and easier to play in tune. The Strads tend to have more of that ambience. Some of the Del Gesus have it, but many of them are quite dark or have less ring to them. For instance, I performed a concert on the Papini Del Gesu of 1739, but because both the hall and the fiddle were so dry, it was difficult to project. So in general, I’d have to say that the Strads were more forgiving to play, although a dark Gel Gesu can hide little blemishes extremely well. Q: Have you found those same characteristics in modern reproductions of Del Gesus? A: Yes, makers who have copied the thick plates of Del Gesu will sometimes end up with fiddles that, although dark sounding, are more difficult to play. A: When I was looking for instruments, the dogs were mostly filtered out for me by dealers and luthiers who knew what I was looking for. At one time I owned the Hochstein Strad (1715), which I took to a trusted restorer for evaluation. His opinion, after much examination and repair, was that it probably had 5-10 years of good playing left. It’s hard to generalize, though: my last Strad was the ex-Barrere, which was a much healthier instrument. It was a composite from both 1719 and 1727, which gave it some rather unique qualities. Its was quite forgiving to play. Another experience was with the Wieniawski Strad, which I borrowed for a series of recitals and recording. It sounded great when I started to practice on it, but by the time of the performances and sessions it had started to show its weaknesses. Q: What’s the difference between the earlier long-pattern Strads and the later models? A: I found the tonal qualities to be similar. The long-pattern Strads just didn’t have the same power and projection. I think I’d prefer a good grand-pattern Niccolo Amati over a long-pattern Strad if given the choice. Q: Do the best Strads and Del Gesus deserve their reputation as the the greatest instruments? A: I think so. But if you look around and get lucky, there are some instruments here and there from the lesser makers that come very close. Take Bergonzi for instance. For a North American orchestral tour with the Concertgebouw Orchestra, Jacques Francais gave me a Bergonzi to break in for him. It had a great sound, but it was very tough to play. On the other hand, I knew a 1733 Bergonzi owned by Johanna Martzy. It not only sounded excellent, but was very easy to play. A really great Bergonzi can be confused with a Del Gesu. I’d also say a Pietro Guarneri of Mantua can be a great instrument, and so can a very good J. B. Guadanini. In addition to grand pattern Niccolo Amatis, I’ve heard great Gaglianos, Landolfis, Storionis, Montagnanas, and others. But as I’ve said, you have to look around and get lucky with these lesser makers. Q: What about wolf notes? Did you find that one or the other (Strads or Del Gesus) were worse in that regard? A: Absolutely. The Guarneris had more problems with wolf notes. One of the first Guarneris I owned, the Lord Coke of 1744, had a bad B natural wolf. As I played it, it even got worse on the D string. I took it to all the fiddle doctors, but no one could fix it so I had to get something else. Q: What if you had not had the option of a Strad or Guarneri? Would you have played on a Lupot or Vuillaume? Something else? A: I probably would have stuck to a Cremonese instrument. One instrument I owned for a time was an unusual Maggini from 1610. Most Magginis are oversized, but this one wasn’t. It had an aggressive and very dark sound, and carried well. It was difficult to blend with a chamber group, though. Q: What about a Pressenda? I’ve played one that had a very Strad-like quality. A: Not bad instruments, but not refined enough for me, at least from those that I’ve heard. I prefer something older. Q: Have you played any violins from other countries that are underrated? 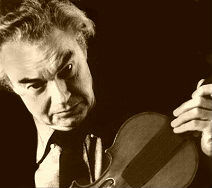 A: One of the greatest Guarneri copyists was the Hungarian maker Samuel Nemessányi. The Voller brothers were also great copyists. In Chicago, someone loaned me what looked like—and sounded like—a Guarneri. There was just something about it—I couldn’t put my finger on it. Something different about it. So I took it to Kenneth Warren to see what he thought of it. “Fooled you, too!” he told me. It was a well-known copy by the Voller Brothers. Q: Were there any instrument you really coveted, but that weren’t available? A: Yes, I would have loved to have had either the ex-Kortschak Del Gesu of 1739, or the Plowden Del Gesu of 1735. Q: Have you owned any modern violins? A: My very last instrument, the backup to my Barrere Strad, was made in Scottsdale, Arizona by Joel Shewchuk. It’s a marvelous, marvelous fiddle. It could really fool you into thinking I was using a Del Gesu. I was able to have a lot of fine-tuning and adjusting done by the maker when I was living in Scottsdale. Q: How long did it take to break in? A: About a year. But it did continue to get better after the initial break-in period. We did a lot of experimentation with strings. This violin really responded with a stark Dominant G, and a steel-core D. I also used my favorite E, a heavy-gauge Westminster. Q: Many people say to put in earplugs and play loud double stops to break in a new fiddle. A: Yes, that is a great way to do it. Double stops really help to bring out the overtones. You can even use a viola bow if you have one. I didn’t use earplugs, though. Q: Have you heard any other modern violins that impressed you? A: I was impressed by a violin of Hermann Janzen of British Columbia. In general, though, it’s not easy to find a really great modern fiddle. You have to try a lot of them, and it gets very tiring to search. Q: Is there any repertoire which is best played on an 18th century instrument rather than a modern one? A: I think Bach is more suited to a darker, less aggressive sound. This may depend on the individual instrument. Perhaps even a darker and very good modern instrument would be better than a bright Strad. Q: Are there any instruments you regret selling? A: One instrument I miss is the Muntz Strad of 1736. It had a strong personality, and was great for playing concertos. It could cut through any orchestra in any hall. It didn’t work for everything, though. It was too big and bright for Beeethoven Sonatas, or other chamber music. It was more like Francescatti’s Strad from 1727, the Hart, though it lacked the nasality of that instrument. The Muntz also had some other interesting characteristics. It was in perfect condition—it looked more like a Vuillaume copy than a real Strad. It was also important for dating Stradivari because he indicated under the label that it was made by him without the help of his sons. Readers: do you have any questions for Staryk? I'll forward them on to him and post the answers.